Mobile developer Tripledot Studios announced today an $8 million seed round led by venture capital firm Velo Partners. Founded last year by industry veterans from King, Facebook, and Product Madness, Tripledot is spread across two sites in London and Minsk, and currently has four ad-funded games available for download. But in a market dominated by goliaths like Supercell, Tencent, and Gameloft, what makes a 24-person team developing games based on public domain IPs like Solitaire and Sudoku worth an $8 million investment? 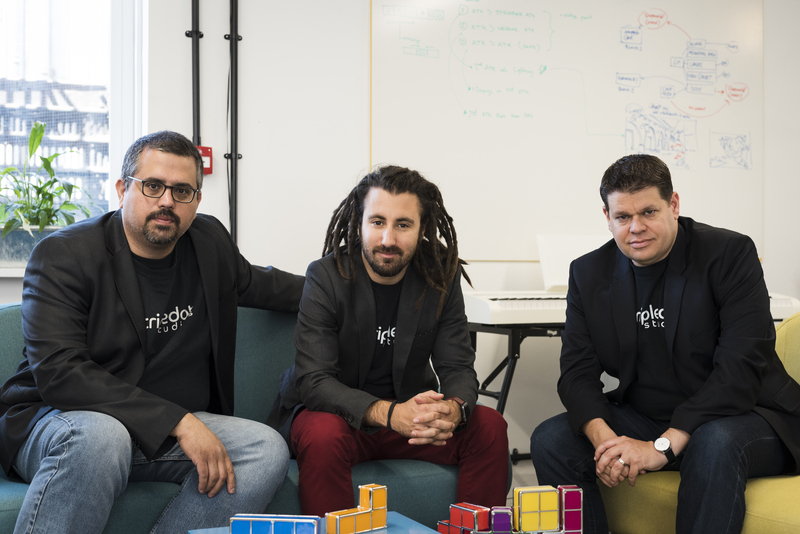 Speaking with GamesIndustry.biz, chief operations officer Akin Babayigit and chief product officer Eyal Chameides explain how, despite its simple appearances, Tripledot is facing down the game industry's most competitive market. "The first phase is we're going to market with games that we know work," says Babayigit. "There is a demand for these evergreen games in the market -- they enjoy really good long-term attention. The real innovation here happens under the hood; it's how we monetise, how we advertise, how we run operations." Looking at Google Play alone, there are countless Solitaire games free to download, but Chameides says that "the devil is in the details" and that "there is a standard and quality level we will not compromise on". One of Tripledot's most successful titles, Solitaire 95, is riding a wave of nostalgia with its retro Windows aesthetic. The mobile market is the most competitive sector of the industry; success is an intensely refined recipe of user acquisition, retention, and monetisation that comes from pouring over limitless data and making endless, tiny tweaks to maximise the potential of every individual aspect. "Do we feel the pinch from all these competitors... Not really because we understand the operational complexity"
It's also an increasingly crowded space that, despite recent discussion of overcrowding on Steam, would make most PC developers recoil in horror. Shortly after Flappy Bird lit the mobile world alight in 2013, thousands upon thousands of clones began flooding the app store and that's a trend which has only continued with the democratisation on development tools. "By definition, we're going after a very crowded marketplace," Chameides says. "That was our strategic decision at the beginning of this process where we wanted to build up our execution expertise and make sure that our games are fantastic and solid, and build on a great technical platform on the user acquisition, monetisation, and operational side. In order to do that, we specifically went after a crowded marketplace." For the most part, free-to-play mobile represents the cold, hard, business-side of the industry. While development cycles are shorter -- and typically cheaper than other platforms -- it's a difficult space to compete without the infrastructure to support an ecosystem of games. Data provided to GamesIndustry.biz by Apptopia show the current kings of hyper-casual, Voodoo and and Ubisoft-owned Ketchapp, have racked up 146 million and 42 million worldwide downloads respectively over the past 30 days. On top of that, the two companies have released 29 games between them in 2018 alone and Voodoo once released 14 games in a single month. "It is still a very tough business; you can't expect to build a success story by just getting a template and going online with it"
With developers like Ketchapp and Voodoo generating hundreds of millions of downloads from hyper-casual games, and building phenomenally successful businesses around the model, more and more small developers have begun fostering the misguided view that hyper-casual is an easy way to get-rich-quick; there's even a small industry growing up around selling people the tools to mass produce mobile games. While there is a flood of have-a-go developers, the idea that just anyone can release a hyper-casual game and find the same success as Ketchapp or Voodoo is just false, suggests Babayigit. "There were a lot of times back in 2005/2006 that 'build your own eCommerce operation' [was popular]," he says. "That's just indicative of the fact that people want to get rich quick, absolutely, but also we've been banging the drum on this pretty loudly for the last five, six, seven years, that mobile gaming is a very attractive business. "It is still a very tough business; you can't expect to build a success story by just getting a template and going online with it. You still need a tremendous amount of know how around metrics, monetisation, and technology. You have to really know what you're doing." The hoard of developers hoping to strike it big with a game built in two weeks might present a very real danger to the PC ecosystem, but it's just the way things are in mobile. The recently deceased 'build it and they will come' mentality of PC has been dead for years in the free-to-play mobile scene. "Do we feel the pinch from all these competitors and all these smaller pressures coming to the business?" says Chameides. "Not really because we understand the operational complexity of making a hugely successful game. Every so often again, there will be a fluke that makes it through but on the whole these things will be blips in the ecosystem but they won't rise to the level of the big players we see in the market without really really sophisticated experience, knowledge, operation, and luck."